The Preservation Department at Seed Savers Exchange works hard to maintain the rare collection of heirloom varieties we've acquired from farmers and gardeners over the past few decades. In order to keep this collection alive and well, our staff carefully plans and implements grow-outs to evaluate the varieties and regenerate seed stock. As part of this evaluation process, staff take meticulous notes about the characteristics of each variety when grown out. These photos document the evaluation process of a few carrot varieties (Daucus carota) after harvest, although evaluations of each variety really begin with the seed before it is planted. Freshly harvested and cleaned carrots. Horticultural Technician Steffen Mirsky takes portrait photos of the harvested varieties. Detailed information is entered into a database for each variety on such characteristics as color, shape, length, and weight, as well as other criteria. Varieties are then scanned and archived with the collected data. 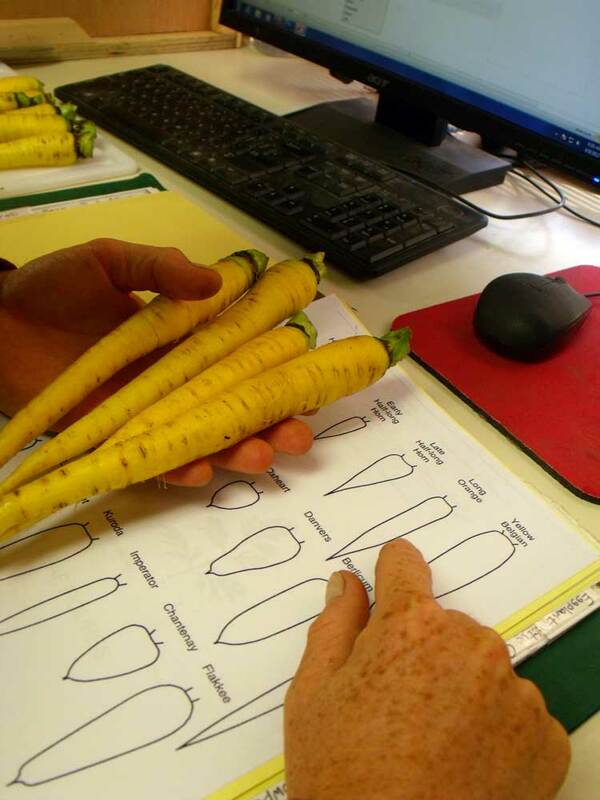 The carrots are sliced to analyze interior characteristics and for raw taste-testing (picture: 'Jaune de Doubs'). The carrots are steamed until tender. The steamed carrots are tasted and evaluated for culinary use. Summary descriptions of each variety are written for the SSE Yearbook, with the hope that these descriptions will encourage gardeners to take the seeds from our collection and put them in their gardens and on their dinner tables (pictured: 'Amstel'). Please consider becoming a member of Seed Savers Exchange to support these preservation and evaluation efforts. Along with many other benefits, SSE members are able to access thousands of rare and unique heirloom seeds offered by other members in our annual Yearbook. Seed Savers Exchange also offers seeds from our vast collection in the Yearbook, allowing members much more diversity to choose from than what's available in the commercial catalog. In 2013, Seed Savers Exchange is offering 2,431 different varieties in the Yearbook for members to request. 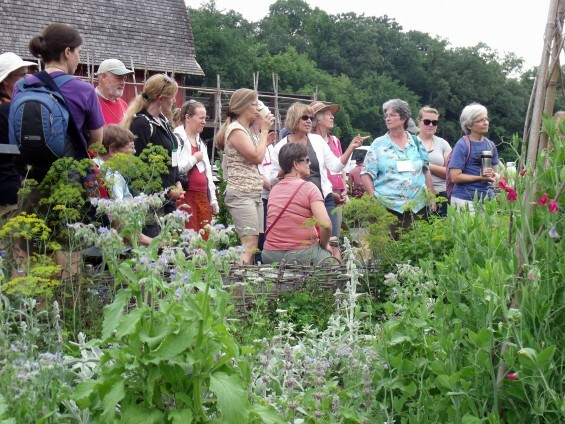 Join us today to help conserve and promote America's culturally diverse but endangered garden and food crop heritage. "The Story of the Root Children" written by Sibylle Von Olfers was a book I read over and over to my children. Each spring I am reminded of this tale when my garden is bare, completely void of any life on the surface, with a tremendous plant source lying beneath—the volunteers. 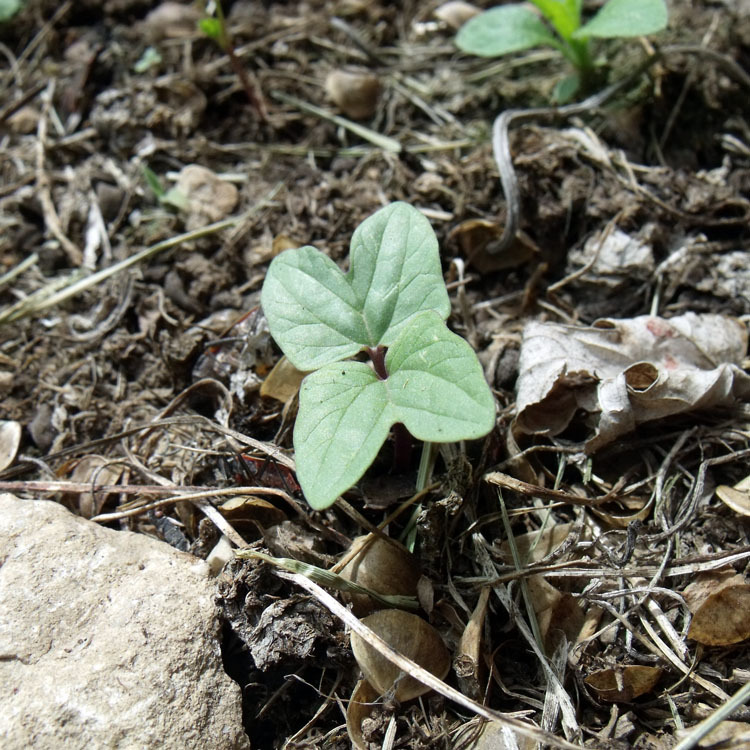 Soon after the first spring rain and the soil warms I see evidence of life after winter, small sprouts all looking familiar and similar. The beauty and challenge of self-seeding annual flowers, herbs and sometimes vegetables is identifying them as volunteers. Over the years I have learned to recognize the plants by their leaves, the order in which to expect their arrival, and where they reliably decide to grow. I feel protective of these sprouts because they do not look much different than many weeds at this point. Most plants are photographed when they are blooming and mature, not when they are just little sprouts. Below are a few of these root children that I found in May while exploring my garden. Look for them coming to your garden soon! I appreciate nature's perfectly designed vignettes, combinations not found in any book or ones I want to compete with... so I don't. I know 'Grandpa Ott's' morning glory will sprout and grow up the side of the barn, my 'Grandma Einck's' dill will volunteer in front of the 'Kiss-Me-Over-the-Garden-Gate,' the calendulas are fine companions for any plants, 'Love-in-a-Mist' will scatter themselves everywhere knowing they can blend into any group and be just fine. Borage is in the strawberry patch, 'Outhouse Hollyhock' along the fence, and violets are usually blooming before I even get into the garden. Visitors sometimes say my garden feels so natural… well it truly is, one that naturally volunteers itself. Check back to the blog throughout this summer and autumn for more posts and pictures of my garden. Heirloom tomatoes are the highlight of summer—beautiful colors and bountiful flavors! Preserve the bounty for next year by saving seed of your favorite tomato varieties. You only need a few fruit to get started, so watch the slideshow below and learn how. By doing so you'll carry on a gardening tradition that is many generations old.